Entergently: Lighted Halloween Jars . . . and other spooky stuf!! Lighted Halloween Jars . . . and other spooky stuf!! 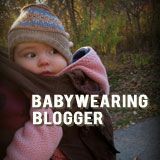 We made these a few wks ago and I have been trying to get them up here to show y'all but I am still having a hard time finding time to blog. 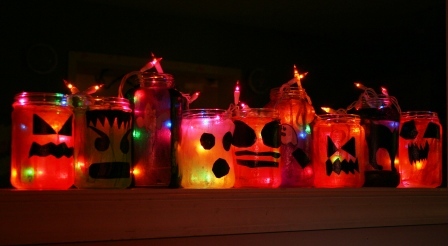 I got this idea last year when I saw the lighted jars at the Not So Idle Hands blog HERE SO CUTE!! But alas, I was too late for Halloween, so instead I made Christmas Jars. Some of you may remember them, I blogged about them HERE. They turned out great and the kids had a ball making them. In fact we are going to have to make more this year because we gave a bunch of them away as gifts last year. 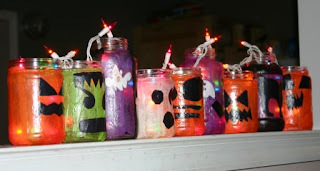 I was very excited though as Halloween came around again so we could do some Halloween jars. We made them the same way we did the Christmas jars. They are pretty easy to make, but beware they are a tad time consuming and can be messy. Though I was doing them with 4 kids so that will take longer. My oldest two (10 and 8) could do much of it themselves, I helped with cutting and stuff, but the younger 2 needed some help with the Mod Podge. And since you have to do multiple layers it does take some time. But it is worth it!! I'll go over the instructions again for those interested. First you want to cut your tissue paper in strips, then cover your jar with a layer of Mod Podge. We usually cover just a small section at a time, applying the Mod Podge then the tissue paper till the whole jar is covered. To make the pumpkins more 'pumpkin like' we did the strips vertically but in the past we have done them horizontally too. For some of the other jars, I just let the kids put the strips on however they wanted. (notice the dummy hanging from the rafters of the porch in the window behind Piper . . .
Once you have the whole jar covered with the paper (and have trimmed off the excess on top and bottom) do another generous layer of Mod Podge over the whole thing, making sure to cover all the tissue paper with a protective layer. It is delicate so take care (and tell your kids to be extra gentle). Once you have done that, then decorate as you wish. 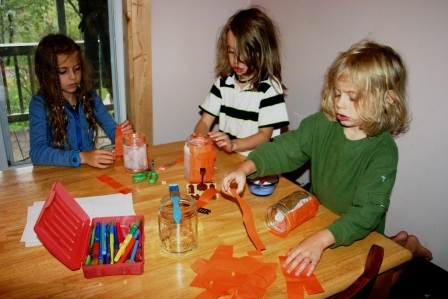 Each of the kids designed their own pumpkin face, then they got to do another jar however they liked. 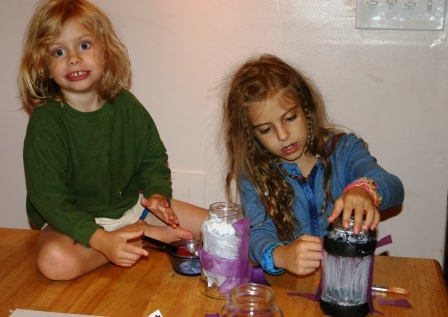 Piper and Ever putting tissue paper on their 2nd jars. Piper (8) drew and colored some black cats (one she colored very dark black, the other she drew on black construction paper and cut out) and we put them on top of her purple jar (with black construction paper stripes on top and bottom) for a silhouette. Xian (10) did a green Frankenstein. He used black construction paper for the face and hair. Arah (6) drew a lot of ghosts and things that he thought were 'scary' out of plain white paper, and then cut them out and put them on his purple/black striped jar. And Ever (3) made a purple jar too, but he added squares of other colors of tissue paper over that along with a few cut outs. I made the white ghost. Make sure you do a coat of mod podge over any additions to your jars. You can use anything to light them. Being glass, candles will work. You can also use battery operated tea lights (I have heard that you can get them at the dollar store 2 in a pack). I have them all lined up so using a string of lights is easiest. Usually I will use white but apparently those were like in the bottom of the Christmas box and not so easy for Charlie to get, so we used multicolored instead and they worked fine. For some reason my pictures of these jars didn't turn out as good as the ones I took of the Christmas jars last year, but you get the general idea. 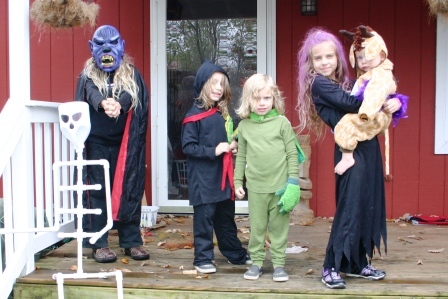 We had a Halloween party with our local natural families group (love those guys!!). The kids always have a ball! 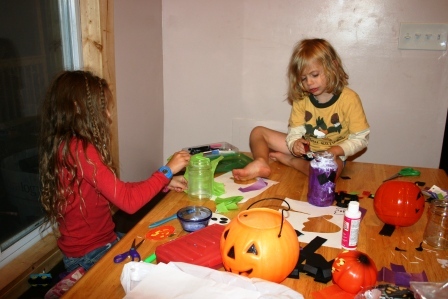 We had pinatas, crafts, games, lots of goodies (we made halloween shaped sugar cookies). Thank goodness we have friends with large houses and generous hearts who are willing to host our bi-weekly gatherings and potlucks (which can sometimes get VERY large). Hope YOU have a great Fall season!! Those are an awesome idea! You could also do a general Fall/Autumn jar design with leaves, pumpkins, and harvest blessings. Sweet! Thanks for sharing! LOL!!! Ah, great minds . . . we just did that a few days ago. 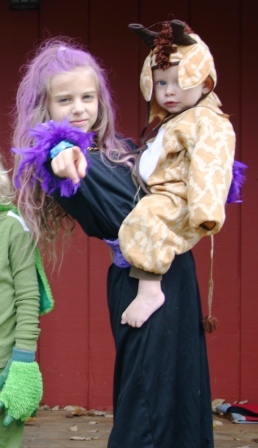 In fact I sat down at the computer just now to resize the pictures so I could post them! We just did autumn colors and then decoupaged leaves. 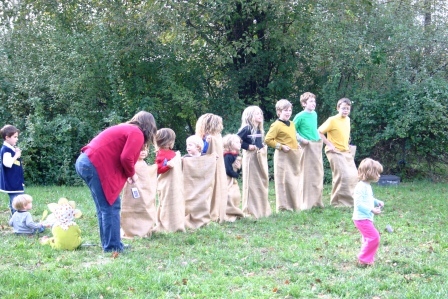 The kids could collect the leaves, learn what the different types were and do most of the decorating themselves! I'll try to get pictures up (in a new post) before tomorrow.